Wash and spin-dry the rocket leaves. Finely mince the garlic and chilli. Heat the olive oil in a large skillet. When hot, add the garlic and chilli and fry gently over a low heat until fragrant. Bring a large pot of water to the boil and add a handful of rock salt. When boiling rapidly, add the pasta. Cook for 3 minutes, then quickly drain. Add the pasta to the skillet with the chilli and garlic, then the rocket. Stir fry over a medium-high heat until the rocket has barely wilted (about one minute). Season to taste with salt and black pepper. 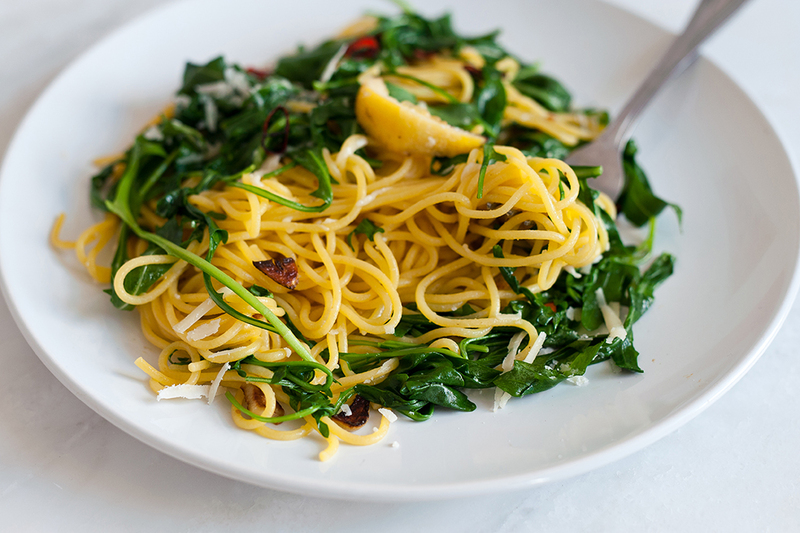 Serve immediately with a generous amount of grated parmesan cheese and a pinch of grated lemon zest. This entry was posted in Talking Ocado and tagged Natoora, Quick Food, Recipes, rocket, Seasonal, seasonal ingredient, seasonal produce by Ocado. Bookmark the permalink.